The Fermilab Booster has been bringing some serious beam. As one of the accelerators in the accelerator chain at the Department of Energy’s Fermi National Accelerator Laboratory, the Booster feeds particle beams to all the lab’s accelerator-based physics experiments. As a general rule, the more beam an accelerator can provide, the better. Following significant upgrades to the accelerator complex, over the last year the Booster has been hitting record highs in beam delivery, meeting or exceeding the increased needs of all of the lab’s beam-based experiments. This year it has already delivered 1 billion trillion protons, smashing previous yearly proton delivery records. Impressively, the lab’s accelerator team has also doubled the beam intensity — the number of particles packed into the beam. The beamlines feed the Fermilab NOvA, MicroBooNE and MINERvA neutrino experiments and the Muon g-2 experiment. Researchers have been happy to have more particles coming their way. Just as you can assess the quality of a diamond by its carat, clarity and color, you can size up a particle beam according to a few criteria — reliability, efficiency and intensity. Intensity is key. With every additional proton you squeeze into a beam, you create another opportunity for scientists to study the workings of the subatomic world. That’s critical for physicists studying rare phenomena who need as many particles as they can get. At Fermilab, the proton beam smashes into a bit of material called a target, producing other particles that scientists then study. Two of these other particles are of keen interest at Fermilab: neutrinos and muons. They clue us in to the nature of the vacuum that pervades space-time and how the universe evolved. But scientists need lots of them to get to the bottom of these mysteries. And that means lots of protons. Earlier this year, after undergoing a major overhaul, the Fermilab Booster set an intensity record. It produced 240 million billion protons on target per hour. This record proton flux (the number of particles that pass a given point over a period of time) was more than two times what it was previously. One factor that increased the flux was a higher repetition rate. Before, the Booster fired beam about eight times a second. Now it’s nearly double that, at 15. One of the Booster’s beneficiaries is the Muon g-2 experiment, which aims to measure a particular property of muons to high precision. As particles travel through an accelerator, some wander from the pack and become lost to the surrounding equipment. An ongoing challenge for accelerator experts is to reduce this loss by drawing on every trick in the book of accelerator science. The Booster team set out to crank up the intensity while keeping losses in check. Multiple improvements to the accelerator chain, including the installation of a new instrument called a laser notcher, kept losses under control. “We doubled the intensity, but the losses haven’t increased one bit,” Pellico said. A powerful proton beam is an incredible tool for discovery — when it’s on. The greater the accelerator’s so-called up time — the fraction of time an accelerator spends in operation mode — the more beam experiments get. The upgraded Booster’s up time is at a record 92 percent, compared to 89 percent before upgrades. Fermilab experiments take beam around the clock, and when particles interact only once in a blue moon — neutrinos are famously reluctant to react — beam availability matters. 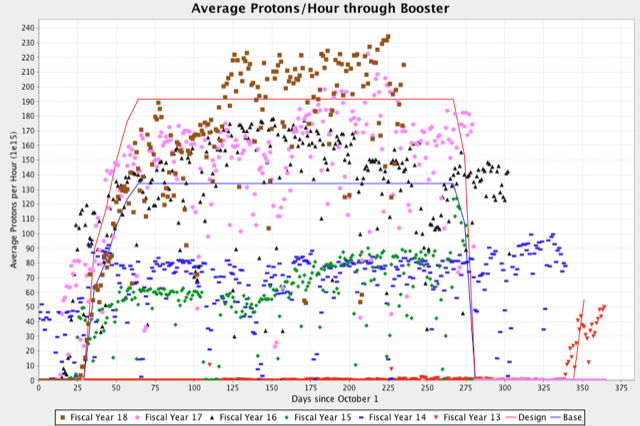 The Booster records are the outcome of six years of Proton Improvement Plan upgrades, a hard-earned achievement by the Fermilab accelerator teams. “The first part of this year, we just kept pushing that Booster record up and up and up,” Newhart said. The team plans to go up and up to higher intensities still. 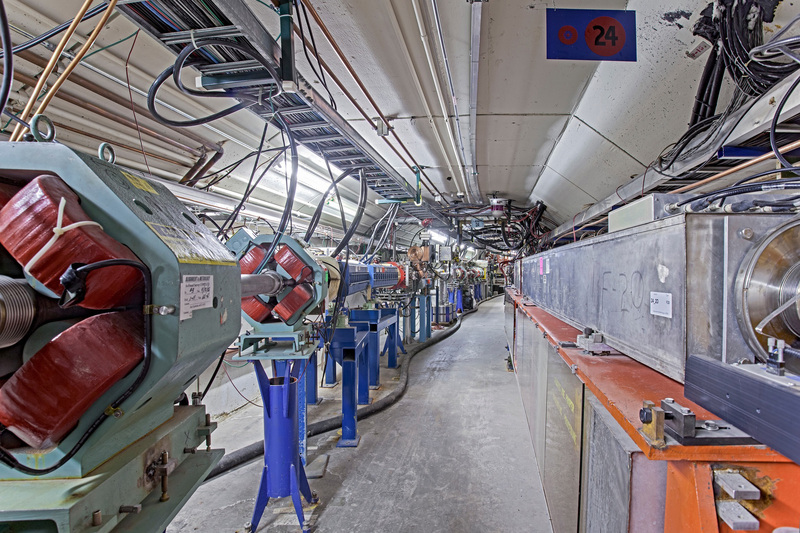 Under the next accelerator upgrade phase, called Proton Improvement Plan II, accelerator experts will improve parts of the complex, including the installation of new linear accelerator, to provide even more powerful proton beams. The megawatt-scale protons — 60 percent more powerful than what is currently available — will be sent to future experiments coming online within the next few years: the Short-Baseline Neutrino Program and the Mu2e muon experiment. The higher-power beams will also be sent to the international Long-Baseline Neutrino Facility and Deep Underground Neutrino Experiment, scheduled to come online in the late 2020s. The Fermilab-hosted LBNF/DUNE will be the largest neutrino oscillation experiment ever built, sending particles 800 miles from Fermilab, in Illinois, to a giant detector one mile underground in South Dakota. And we can always use a little more beam.